Horay, Halloween Day 2009 is Here! The weather is drizzly on the east coast but the temperature outside is pretty fair. Halloween falls on Saturday this year, providing trick-or-treaters even more opportunity for attending Halloween parties and events during the day. Here are some precautions or safety rules for trick-or-treating! If your children are younger, please go with them door to door. Older children should have buddies or friends to go with. Make sure children wearing masks can see clearly. 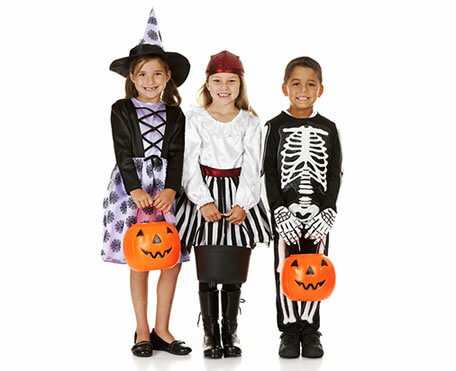 Children wearing dark costumes should attach reflective tape or stickers to make themselves more visible, at night. Use a flashlight and make sure it isn’t on this recall list. Inspect your children’s candy after they get home and before they eat it. Adults should refrain from drinking and driving, if they are attending Halloween parties. If you have any Halloween 2009 experiences you’d like to share submit your report for inclusion on this site. Please help others enjoy the Halloween Holiday and benefit from your wisdom by sending in your tips. Three Midnight Syndicate CDs make AOL Radio’s Top 10 Halloween Music CDs of all-time. AOL Radio has just released a list of the Top 10 Best Halloween Music CDs as ranked by AOL/CBS Radio listeners. In the company of such greats as The Exorcist soundtrack and Rob Zombie, three of the ten CDs were Midnight Syndicate discs (Born of the Night #8, Realm of Shadows #4, and Vampyre #3), ranking only behind Danny Elfman’s Nightmare Before Christmas and John Carpenter’s classic Halloween soundtrack. Vampyre and Out of the Darkness (a collection of the best music from Born and Realm) are currently available at your local Halloween retailer – see below! 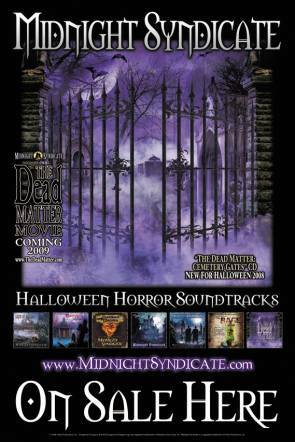 Midnight Syndicate CDs in stores nationwide this Halloween season! Midnight Syndicate and Van Helsing’s Curse CDs are now available at your local Halloween retailer. To find the store nearest you, visit our Store Locator or shop online at the Midnight Syndicate Store. the list of celebrities to brave the theme park’s frightening annual event. Do you have any Halloween Horror Night experiences or photos to share? Jot your experiences in the comments section or email us your photos at zombie@365halloween.com!